HOMEOWNERS, ARE YOU COVERED? – Ross, Stepien & Kadey, Inc.
Mortgage insurance does NOT insure YOUR HOME. It insures the BANK if you default on your loan. 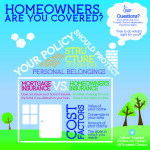 Homeowners insurance provides coverage for your home in the event of a loss. Value of your home (Replacement cost, not Market value). Crime rate in your area. The state in which you reside. Check with your local independent insurance agent for more information. I have never actually heard of mortgage insurance before. It makes sense that it wouldn’t insure your home though. I also thought it was interesting that crime rate in your area can affect your insurance. I guess that’s another good reason to live in a good neighborhood.